Sports videogame franchises have it rough. Year after year, you have to crank out your product and make a case to the consumer for buying your incrementally better game (at least better in theory). Not only do you have to bring something original to the table to set the new game apart from previous years, but the core gameplay can't change to the point where you risk alienating long-time fans of the series. 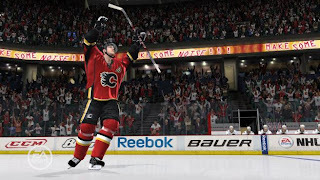 NHL 10 is a game that offers a robust feature set that should keep hockey fans busy long after the Leafs have been statistically eliminated from playoff contention. NHL 10 comes with more ways to play it than you might expect. There are the usual suspects of quick matches and season modes, but beyond that you have the options of GM or Be a Pro mode. Either of these modes will offer you a very different experience, as either the Machiavellian GM pulling the strings, or an up and coming player who goes through the drafting process to your first NHL game (and subsequent dismissal to the AHL if you play as poorly as I did). Be a Pro mode quickly became my favourite way to play the game. The level of feedback you receive on what is expected of you as a player really made me want to improve my performance the next time I was on the ice. Additionally, the RPG-style stat improvements that you unlock by scoring points contributed to more than one instance of "just one more game", all in the name of unlocking a stat boost. Unfortunately, the uglier side of DLC rears its head here, as you can purchase stat upgrades with actual cash for your star rather than unlock them through merit. I realize this is a growing trend within many games whereby the "I don't have time to do this" argument inevitably crops up as justification for paid unlockables, but to me that just takes away from the overall experience. Of course, none of these modes matter at all if the hockey found within them is flawed. Sadly, this is the case with NHL 10. If you're planning on playing entirely online against human opponents or with your buddies in your living room, then you can safely disregard this criticism. If you're like me though, and the thought of being schooled by the online equivalent of Ovechkin brings a sour look to your face, then you are probably going to be slugging it out primarily with the AI, and that my friends is going to raise some issues. Issues like defensemen who love to put the puck in their own net. Not once every 50 games either. In the first ten matches I played, it happened 4 times. I'm not talking about my team-mates either, but rather the opponents who decided I was so bad at the game that they needed to put a few in their own net to even things out. While I certainly appreciated the help, it couldn't help but feel like a hollow victory. This is really only the start of the AI issues though. Errant passes aimed at no one are frequent. Don't mistake these for dump-ins either. These passes were clearly intended for some sort of phantasm that only the AI can see, because my mortal eyes saw nothing but empty ice. This is particularly frustrating in the Be a Pro mode, because you'll be controlling one person, thus much of the passing is out of your hands. If there is one area where the game really trips over the blue line, it has to be the audio commentary. There is way too little player identification, you'll hear far more "he dishes it over to the wing" rather than a player name. They will also say things that are completely inaccurate from time to time. For example, during a 1-1 tie, they were discussing how a team "needed to finally get on the scoreboard". Huh? Good commentary goes along way in creating an authentic hockey experience, but they shot it over the boards with this game. It's far from all bad news though. The new first person fighting system is a hoot the first time you drop the gloves. And speaking of penalties, they seem to have cut down on bad calls. For the most part, it reflects the current state of the NHL penalty calling, and regardless of what you might think about that, it can at least be said to be as close to the real thing as possible. The graphics look crisp, and famous players are recognizable. The soundtrack was passable, I believe you can throw your own tracks in there if you wish. In the end, you are left with this question of how much average AI behaviour you are willing to put up with to experience the plethora of game modes. If you can put aside the issues I mentioned, I think there's enough to keep you playing for a long time. I fully expect to go back into Be a Pro mode and get a certain left-wing back into the NHL. Fame and glory sure to follow. Thanks Clinton, glad you enjoyed it. Good review. My only ongoing gripe with EA's NHL series is the inclusion of a ridiculous amount of lame European teams that no one cares about or uses and the exclusion of much loved heritage teams. I'd sure like to see the Winnipeg Jets, Quebec Nordiques, Hartford Whalers and more in the game instead of just a few token throwback jerseys. I like how they added a centenial montreal canadiens team last year which was included in the game again this year, hoped for more but was disappointed.